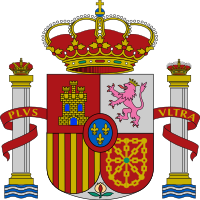 ^ 1.0 1.1 Spain. Encarta Online Encyclopedia. 2007. （原始内容存档于2009-11-01）. See also: 'First west Europe tooth' found. BBC. 30 June 2007 [2008-08-09]. ^ Spain - History - Pre-Roman Spain - Prehistory. Britannica Online Encyclopedia. 2008. ^ Spain - History - Pre-Roman Spain - Phoenicians. Britannica Online Encyclopedia. 2008. ^ Grout, James. The Celtiberian War. Encyclopaedia Romana. University of Chicago. 2007 [2008-06-08]. ^ Major Phases in Roman History. Rome in the Mediterranean World. University of Toronto. [2008-06-08]. ^ The Roman provinces of Hispania included Provincia Hispania Ulterior Baetica (Hispania Baetica), whose capital was Corduba, presently Córdoba, Provincia Hispania Ulterior Lusitania (Hispania Lusitania), whose capital was Emerita Augusta (now Mérida), Provincia Hispania Citerior, whose capital was Tarraco (Tarragona), Provincia Hispania Nova, whose capital was Tingis (Tánger in present Morocco), Provincia Hispania Nova Citerior and Asturiae-Calleciae (these latter two provinces were created and then dissolved in the 3rd century CE). ^ Payne, Stanley G. A History of Spain and Portugal; Ch. 1 Ancient Hispania. The Library of Iberian Resources Online. 1973 [2008-08-09]. 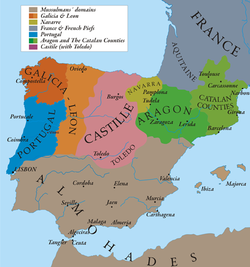 ^ This led to the establishment of the Suebi Kingdom in Gallaecia, in the northwest, the Vandal Kingdom of Vandalusia (Andalusia) and the Visigothic Kingdom in Toledo. ^ Catalan Company (1302-1388 AD). [2009-05-01]. （原始内容存档于2009-02-08）. 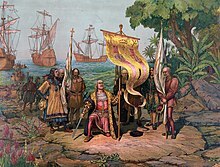 ^ There is simply no consensus as to the extent, with estimates varying by many orders of magnitude, but that it occurred is not doubted - See Population history of American indigenous peoples. ^ Patrick, James. Renaissance and Reformation. Marshall Cavendish. 2007: 207. ISBN 0761476512, 9780761476511 请检查|isbn=值 (帮助). ^ When Europeans were slaves: Research suggests white slavery was much more common than previously believed 互联网档案馆的存檔，存档日期2011-07-25.